NOTES: Short run with vac canopy, metal gear legs and resin wheels. Arguably the best Russian fighter of the Great Patriotic War, the Yak-9U (U for improved) was initially based on the VK-105PF-2 engine. Fluid capacities were increased and the chin radiator disappeared to be replaced by ones in the wing leading edge, much like the Yak-3. It is difficult to tall the difference between the early Yak-9U and the later Yak-9M as the changes were evolutionary and added on the production line. As much as this new variant was an improvement over earlier types, it still was not that big a performance leap. This changed with the VK-107A engine that was installed in later Yak-9U aircraft. This engine provided a considerable power improvement, but was not very reliable. In fact, the engine was prone to catching fire after as few as 25-30 hours of operation and of the 10 Yak-9Ds fitted with this engine for operational trials, eight of them had catastrophic engine failures. Many went to the gulags over this. Despite the problems, production fighters rolled off the assembly lines with these engines in a hope that fixes could be quickly found. Nevertheless, these planes were sent to the front where pilots and mechanics found out the problems with the engine. This did not build confidence in the type and special teams with captured German planes were sent to various units to show the superiority of the aircraft. By the time late 1944 arrived, the aircraft were doing quite well and were praised by both pilots and mechanics alike. The aircraft was as good or better than the P-51D in all fight aspects, with the exception of high altitude performance, where the Mustang was superior. Eventually the engine problems were fixed and the aircraft went on to serve well in the VVS and in the air forces of other nations. To be a bit simplistic on things, the Yak-9P was basically the same as the Yak-9U, but was of all-metal construction instead of mostly wood. Early Yak-9Ps did have some parts of the aircraft in wood, but eventually metal took over, resulting in a lighter and more sturdy airframe. This reduced weight also meant greater performance. Much of the reason for going to metal is that the wooden planes were not designed to last very long. Now that the war was over, a more long-lasting and better built airplane with higher quality control was needed. That, in the Yak-9 family, was the Yak-9P. It was also the end of the Yak-9 line as turbojets were the coming thing. A number of Yak-9P aircraft were also exported and some found their way to North Korea where they were briefly used in the opening phases of the Korean War. High Planes is an Australian company that produces a variety of short run kits in all scales. These are very much what one expected of short run injected kits a few years back and I'm sure this is one of their earlier molds. These kits are truly not for the beginner as most who have no experience with kits of this type will probably turn away in horror at what he sees when opening the box. Those of us who are more seasoned pretty well know what to expect. 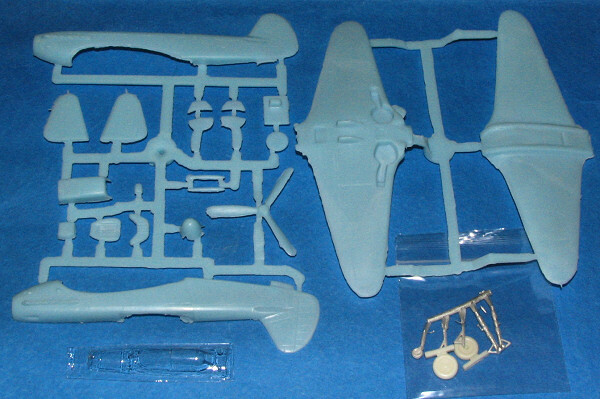 High Planes must have a deal with light blue plastic as every one of their kits I've seen is molded in this material. The sprue attachments are large, the parts generally have flash of a certain amount and the inside surfaces of most parts is rather rough. Some of the larger kits have huge mold runs, but this one does not. Once you get beyond the flash, you'll find that the kit has finely done engraved panel lines, some of which may well go away under filler and filing. The cockpit is quite basic with little more than an instrument panel and seat. No control stick and no sidewall detail. A radio compartment is supplied for behind the seat and so that you'll see something through the clear bits. Gear wells are admirably deep and devoid of detail (which may be prototypical, I don't know). Main gear and retraction struts are in cast metal and a fine job of casting it is with no mold misalignment that I could see. The wheels are resin and also quite well molded. There is a single vacuformed canopy that includes the clear bit that goes on the upper fuselage. This is for the installation of a DF loop (which you have to make). Instructions are a single folded sheet of paper. One side has an exploded view of the kit and construction notes. These notes include how to make some of the smaller parts. I find it good that the instructions tell you to trim the canopy first and then work on getting it to fit the fuselage. It is always best to get that done right first. There is no information on painting the various interior bits, but they are probably either black or light grey. The other side of the instructions has four superbly drawn profiles for the markings that are included. 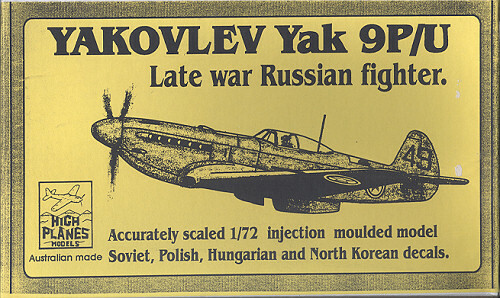 They include Yak-9Ps from Poland, Hungary and North Korea. These have the clear DF loop panel. The other is a Yak-9U from the Soviet Air Force. The only colors these things seem to have been painted in are either an overall light grey or Dark Green over Light Blue. 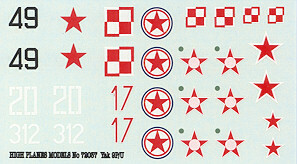 The decal sheet is very nicely printed, quite matte, and with somewhat large clear carriers around each marking. As you might image, this is not a kit for beginners. It is, however, a good one for those who want to get into doing short run kits. It will develop modeling skills, but won't be so frustrating as to put one off the genre. What's more, it is a subject that doesn't get a lot of press, that of post war Soviet piston fighters. A little effort and you should well have a fine model. Review kit courtesy of me. Once again, my penchant for the unusual overwhelms my common sense! If you would like your product reviewed fairly and quickly by a site that has over 300,000 visitors a month, please contact me or see other details in the Note to Contributors.